Commander is an NPC in Nier: Automata. 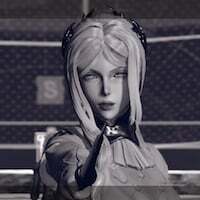 Director of the Bunker, a base that floats in the satellite orbit, and the person in charge of commanding all YoRHa units. She conducts herself in a level and calm manner, but seems to care about 2B and 9S. It also seems she has some sort of connection to the YoRHa prototype model A2. The calm and composed commander of the YoRHa units and director of the orbital satellite known as the “Bunker”. There is some connection between her and A2. Despite being called a "hardass" by 9S, it is revealed by Operator 6O that the Commander actually leaves her clothes strewn all over her private quarters and she rarely does maintenance on her body. I want to protect that stern gaze.